Dance Contra and English, Sing with Friends and Play Music in the Woods! Dugan Murphy lives in his favorite city, Portland, ME. 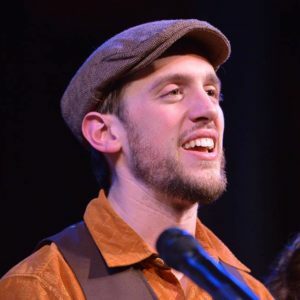 He is a nationally known contra dance caller, co-organizer of Portland Intown Contra Dance, a Maine Humorist, a voice artist, a storyteller, and a non-profit consultant. And he does most of this with his wife, Dela Murphy. 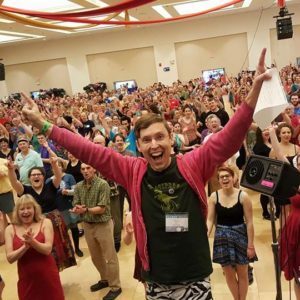 Out of the many best moments of his life, he’s pictured above calling dances at Flurry Festival to a room of over 750 dancers. He’s still feeling the contact high. Adina Gordon finds an outlet for her loves of travel, music, dance and silliness by calling and dancing throughout the US and Canada, creating joy and minor chaos wherever she goes. Combining a voice that makes you want to do what she says with a commitment to using that power for good and not evil, Adina calls contra, English and squares both old and new that cause spontaneous eruptions of joy on dance floors. 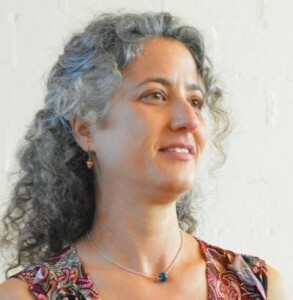 Based in Burlington, VT, Adina has called dances in 37 US states spanning all six American time zones, as well as 3 Canadian provinces and Israel. Dancers frequently remark on Adina’s energy and joy, which is both highly evident and highly contagious. She believes that when it comes to dance, If you’re laughing and smiling, you’re doing it right. Adina’s goal is to get you dancing and get out of the way. She says more, with fewer words, to maximize dancing and minimize talking. 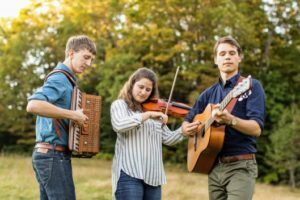 Hailing from New England, Nova is a contra dance band that weaves the sounds of fiddle, accordion, and guitar into a rich tapestry of sound. Nova draws from both traditional repertoire and original compositions to create versatile, high energy and driving dance music. 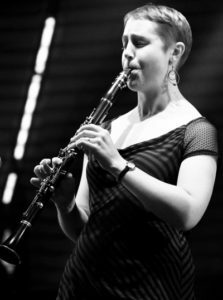 Anna Patton plays clarinet with great verve, clarity, and harmonic whim, drawing on a richly eclectic musical background of jazz, classical, traditional, and world music. Based in Brattleboro, VT, she performs full time for dances and concerts, composes and arranges music, and teaches ear training and swing harmony singing. Anna’s current projects include playing dance music with bands such as Elixir and The Figments, string-band and vocal swing with Housetop, Brazilian and gypsy jazz gigs with The Will Patton Ensemble, and improvisatory Balkan/ African/ South American influenced originals with the As Yet Quintet. 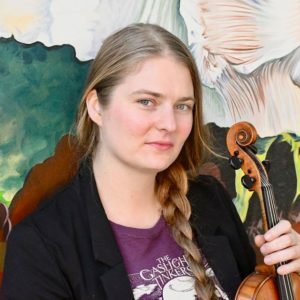 Her solo album, Isadore’s Breakfast – featuring her work on clarinet and vocals along with many of Vermont’s finest musicians – is a mix of French-influenced swing and fiddle tunes. Raised in Honolulu, Audrey was classically violin trained from the age of 5, studying principally under Darel Stark. (Hawaii Symphony). After receiving a full music scholarship at Hawaii Pacific University, Audrey later transferred and received her B.A. in Music Production and Engineering at Berklee College of Music in Boston. While in New England, Audrey explored other musical genres and made a name for herself primarily as a world folk musician. She taught for over 5 years (piano and violin) lessons at Kingsley Montessori School. She also worked closely with the school to create a Montessori based music program that she incorporated in the preschool classroom. Having recently moved to the Bay area, Audrey continues to tour the US in several bands (Wake Up Robin, The Gaslight Tinkers) and spends the summers teaching at several dance and music camps. As a teacher, Audrey centers her teaching on making music a part of the student’s life, and bases her curriculum on the interests and passions of the individual student. With a background in Audio Engineering, she also focuses on incorporating technology in the study and growth of the musician. Aaron draws on a rich background of musical traditions including New England contra, classical piano, English country dance, West African, and old time.Well known throughout the Northeast for their performances with Giant Robot Dance, Gift of the Marcii, and The Turning Stile, Aaron brings exuberant energy to Frost and Fire whether they’re vamping on piano or clogging while playing tunes on concertina. Aaron divides their time between Hancock, VT and Montpelier, VT, where they work as an endangered-species botanist. Jeremy holds a MA in dance anthropology, and is a bit of a dance nomad, from studying Swedish folk dance at the Erik Sahlström Institute in Sweden to traveling across Europe on a Watson Fellowship, collecting sword dance traditions. He is a well-known in the folk music and dance community for his singing, dancing, and has taught traditional music and dance on five continents! Jeremy is a former member of the Swing into Summer committee, and will be teaching BalFolk at the weekend! 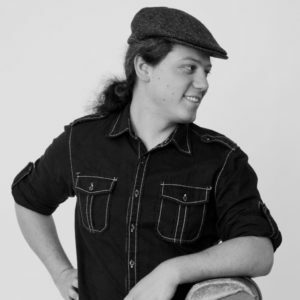 Max hails from Alaska and now resides in New England, where he has made his living as a practitioner of traditional music for the past decade and half. Music has taken him many wonderful places, made him countless friends, and provided him with many memorable experiences. 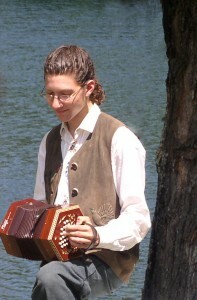 He has played across the United States, Canada, and United Kingdom. He has played large festivals, tiny New England grange halls, the dusty streets of Burning Man, and performed for the President of Ireland. He has placed a particular emphasis on playing dance music. He is fascinated by the marriage of music and dance. A significant part of his musical career has been dedicated to exploring those connections, which he hopes shines through both at a dance and in concert. Max is a former member of the Swing into Summer Committee and longtime teacher of the “You too can Uke!” class at the weekend. Fynn Crooks used to have a fear of hurdles, but she got over it. Oh, that’s terrible! As a storyteller, humorist, and teacher Fynn has been sharing bad jokes, tough riddles, and a healthy enthusiasm for life with her students, young and old, for a decade. She loves leading group games to encourage communication, cooperation and just plain goofiness. 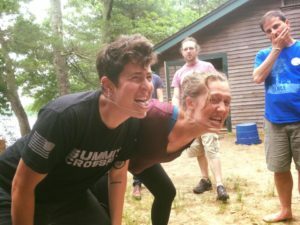 You might find Fynn launching a rubber chicken across camp, leading a silly circus, lifeguarding, telling a folktale, teaching the art of marshmallow catapults, or just dancing with wild abandon. Whatever she does, you’ll sure want to join in the fun – her energy is infectious, but don’t worry, she washes her hands often!